Being downsized from my job as a medical rep for a pharmaceutical company was the catalyst that changed our lives forever. In 1999, my husband, Rick, and I exchanged our hectic corporate life in Calgary, Canada, for a more relaxed one in Huatulco, Mexico. It was here that we built the ocean view villa that became our B&B, and our own perfect income. I love entertaining, but my hectic career in Canada left me with little time to do it. With a B&B, interesting people from around the world come to us—and pay for the privilege. What could be more perfect? We chose Huatulco, a small resort town in the state of Oaxaca, because it was developed as a tourist destination. This made buying land a safe purchase. The town is neat as a pin, with First-World infrastructure, including paved, palm-lined streets, and reliable water, sewage, and electricity. The semi-tropical climate is perfect. We rarely see rain between November and May, and even during the rainy season, it falls mostly at night. The 36 beaches are the main attraction of Huatulco and the sea is warm enough to swim in year-round. In fact, from May to October it might feel like a tepid bath. I love to take my dog to the beach because nothing expresses pure joy better than Tango frolicking in the surf and rolling on the sand. We often have a virgin beach all to ourselves, but if I want to enjoy a margarita with friends there are several great beaches for doing so. I also enjoy hiking. There are lots of places to wander through the forest and enjoy nature. I am not a birder but 80% of Mexico’s birds pass through this region and it is entertaining to watch our feathered friends. One of the reasons we chose Mexico was the friendly nature of the people. 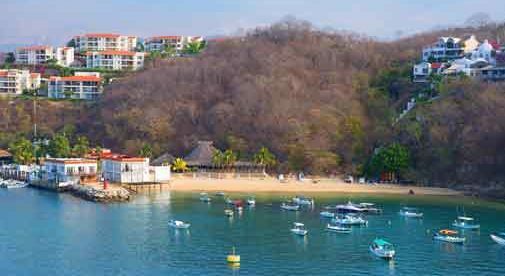 In Huatulco, they are not only pleasant, they are incredibly honest too. After my husband paid the lunch tab, I have been known to forget my handbag, sitting on the empty chair. It was always still waiting for me when I returned. 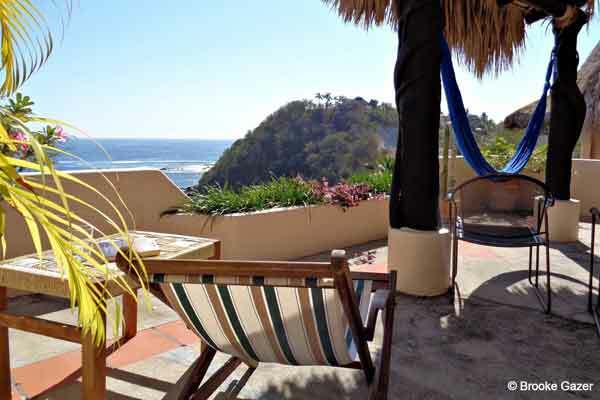 Since Huatulco was developed for tourism, it has a wide selection of restaurants. Comida corrida, a Mexican style three-course lunch that includes a beverage, costs just $4. Our favorite taco place serves an alambre which is meat, cheese, and vegetables chopped up, cooked together on a grill, and served with a stack of fresh corn tortillas. An order costs $4.50 and I challenge anyone to try eating two. On special occasions, we might splurge on a three-course international gourmet dinner with wine for about $23. The same quality in a U.S. city would average $70. Food is not only a fraction of the price, it’s more delicious. Tomatoes are sweet and juicy, and carrots taste like carrots, not like cardboard. Today, I bought an enormous red papaya, a cantaloupe, a pineapple, a bunch of mini-bananas referred to as dominicos, a half-dozen small guavas, and a dozen sweetheart roses, all for roughly $10. In the mornings at our B&B I enjoy the company of the guests while I make them breakfast. Most days, we have the rest of the day free. If we had six guest rooms in Canada, I would be cleaning and doing laundry all day, but in Huatulco, the maid even does mine. In the afternoon, if I am not at the beach or socializing, I enjoy laying in my hammock reading a book. This is a luxury I rarely had time for in my demanding previous life, and I savor it. The pace here is easy and relaxed…and isn’t that the whole point?